President Obama’s announcement of a proposal to make “two years of community college free for responsible students across America” and, among other agenda items, ensure that community colleges offer academic programs that fully transfer credits to local public four-year colleges and universities is commendable. Confusing transfer credit policies are some of the many barriers community college students face on the path to a bachelor’s degree, but not just at the local level. Students who wish to transfer to, and have the ability to succeed at, highly selective institutions across the country can find their chances ruined by taking a course load that does not transfer. Other barriers include a lack of college advising, limited financial aid at the four-year institution, and a paucity of transfer slots. Data show that as few as 12 percent of community college students who express an intention to transfer and complete a bachelor’s degree actually do so. High-achieving community college students from low- to moderate- income backgrounds succeed academically and contribute to the intellectual life of their campuses at highly selective four-year institutions when provided the opportunity to transfer and adequate financial aid. With more than a decade of experience as the largest provider of scholarships to enable community college students to transfer to four-year institutions, we have seen our own students excel and benefit their campus communities at the best colleges and universities in the country. Knowing that community college students need pre- and post- transfer support to be successful on four-year college campuses, we funded an initiative to identify effective strategies for both community colleges and four-year institutions to improve the transfer process. Between 2006 and 2014 the Foundation funded 14 highly selective colleges and universities to increase the number of high-achieving low- to moderate-income community college students who transfer to, and succeed at, their institutions through the Jack Kent Cooke Foundation Community College Transfer Initiative (CCTI). With the Foundation’s support, these institutions developed programs, policies, and partnerships with community colleges to improve student preparation, assistance with admission and financial aid, orientation and “bridge” programs, and post-admission support. CCTI students performed well academically, collectively maintaining a 3.0 GPA, earning 95% of the credits they attempted, and persevering to graduation. They also became campus leaders and formed campus organizations. Two-year colleges enriched their institutional transfer culture, improved advising programs, and enhanced efforts to develop more rigorous curricular and honors programs. At four-year institutions, the CCTI contributed to cross-campus collaboration and communication, and increased the diversity of the student body in terms of life experiences, income, and maturity. High levels of institutional readiness and buy-in are associated with more effective and sustainable programs; “paving the way” may be as important as program design. For maximum success, institutions must find and prepare the right students and support them through and after transfer. 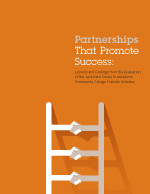 The most effective and sustainable programs had the most robust partnerships between community colleges and four-year institutions. To read the Jack Kent Cooke Foundation’s key points and full report from the evaluation, visit https://www.jkcf.org/news/research/.